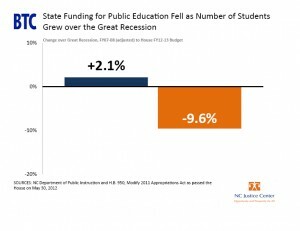 A recent analysis by the Budget and Tax Center shows that funding for K-12 education has declined by almost 10% over the past 5 years while enrollment has increased by more than 2%. While the counterintuitive claim that money does not matter in education has become surprisingly common in recent years, the effects of the declining investment in education have already been felt in the place that matters most for our state’s children – the classroom. One of the few certainties in education policy is that high quality teachers are the key to improving student achievement, and over 90% of spending on K-12 education goes into teacher salaries. 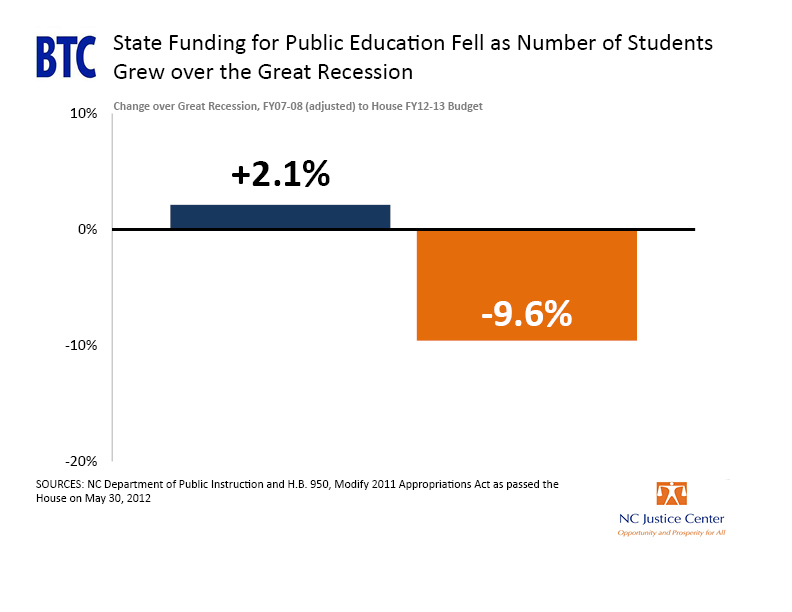 North Carolina’s disinvestment in education has led to teacher layoffs as well as stagnation in teacher’s salaries, which lag well behind the national average. Without investing in teachers, North Carolina schools will struggle to attract the highest quality teachers to the profession. Other vital services that directly impact the classroom experience have been cut completely or dramatically reduced in recent years, including funding for textbooks, classroom supplies, teacher mentoring, and professional development. North Carolina’s population is growing and the need for a highly educated workforce to keep pace with the demand for highly skilled jobs is already upon us. Now is the time to invest heavily in education as a cornerstone of North Carolina’s long term plan for economic development rather than continue to chip away at the public education system that educates the overwhelming majority of citizens.